The increased sourcing of renewables, such as solar and wind, is helping California meet ambitious clean energy and greenhouse gas reduction goals. But it also complicates the operation of the power grid. That is because solar and wind are intermittent forms of renewable energy whose generation levels can vary suddenly. This lack of consistent production can cause imbalances between supply and demand since neither the forecasts of intermittent supply or loads are exact. The California Independent System Operator (California ISO) has established and operates the Western Energy Imbalance Market to trade these imbalances throughout the West. When these generation levels suddenly drop, another generation source--such as natural gas or hydropower--must be increased or ramped up. Without a flexible resource, electricity demand must be reduced. Every day, as the sun rises, solar production rapidly increases while the energy load also increases as people wake and businesses start. Flexible generation levels must adjust to keep supply and demand in balance. In the evening, as solar generation rapidly drops and loads increase as people return home, some flexible generation resource must fill the void to balance supply and demand. Those energy transitions, called ramps, can be dramatic. In some cases, California can need as much as 13,000 megawatts (MW) of additional electricity within a few hours in the evening. “As California sources more and more of its energy from wind and solar it will have to develop resource flexibility, along with flexible loads, to meet the challenge of that variability,” said California Energy Commission Chair Robert B. Weisenmiller. Adapting to the variability of wind and solar to balance supply and demand to avoid shortages and oversupply is the focus of a recent Energy Commission tracking progress report. California’s rising use of renewables, coupled with ambitious renewable energy goals, like sourcing 60 percent of its electric energy from renewables by 2030, will enhance the need for resource flexibility. Long-term options to enhance flexibility include advancements in storage and demand response technologies, according to the report. At present, 34 percent of California’s electricity sales comes from renewable energy. In 2018, solar and wind generation accounted for more than 69 percent of renewable electricity generation. The impact is significant. On May 26, 2018, renewable energy served 73.9 percent of demand. Matching demand to supply is difficult because California must meet its energy need by finding energy supply for every second of the day. 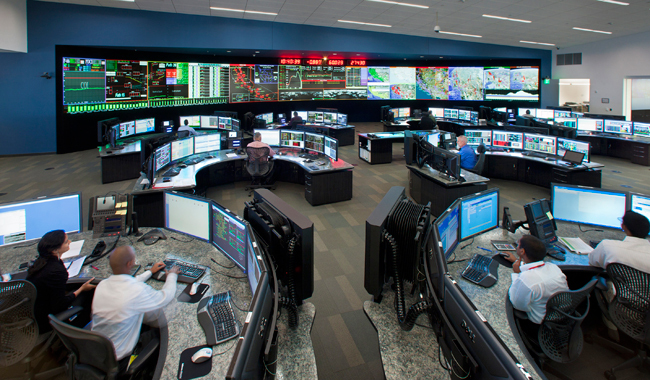 The California ISO, which operates most of the state’s grid, is responsible for doing that. 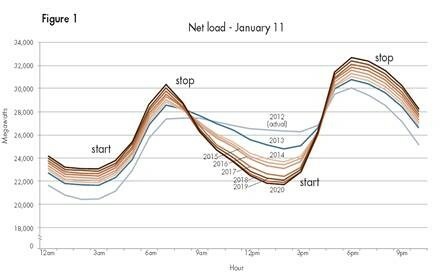 The California ISO is improving forecasting methods for renewable generation and applying them to a newly configured day-ahead market and using shorter time scales to more accurately predict variable energy supply and demand. Figure 1: This graph shows MW amounts of non-variable energy that must be met, on the y axis, over different hours of the day on the x axis. At one time, the grid was scheduled on an hourly basis, but one way to more accurately forecast is to shorten the scheduling period, for example to 15 minutes. Analyses suggest that flexible capacity has to address variability in load and power production in three time scales: seconds-to-minutes, five-to-10 minutes, and multi-hour increments, according to the report. The Western Energy Imbalance Market has allowed inevitable energy imbalances to be traded and saved utility customers more than $500 million. Avoiding the curtailment of renewable energy has avoided the release of more than 8,100 metric tons of greenhouse gas. Additional renewable energy resources are only a part of the emerging technologies that are needed to help transform the grid to meet the challenges of the 21st century.